'Mukkalu' in Telugu literally means 'Pieces' and 'Pulusu' means 'Stew'. 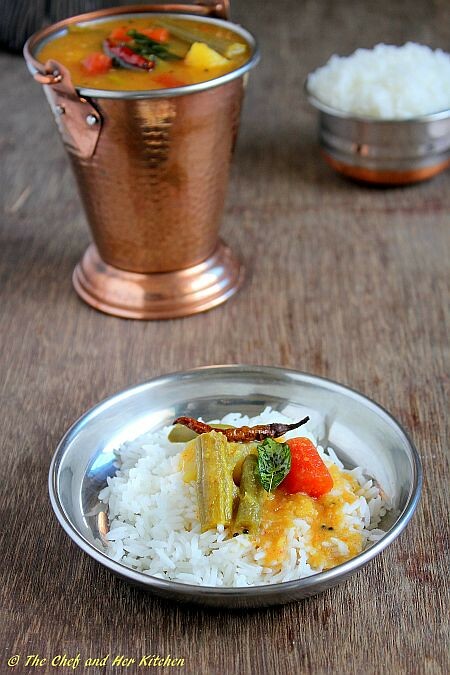 In Mukkala Pulusu, we use various vegetables which are chopped into big chunks, cooked in tamarind extract and spiced up slightly.It is usually paired with Mudda pappu(mashed plain toor dal) and papds/fryums which is the ideal combination.While a few add some rice flour mixed in water to thicken this pulusu, I usually prefer to add some toor dal as it not only thickens the pulusu, it also adds to the taste. 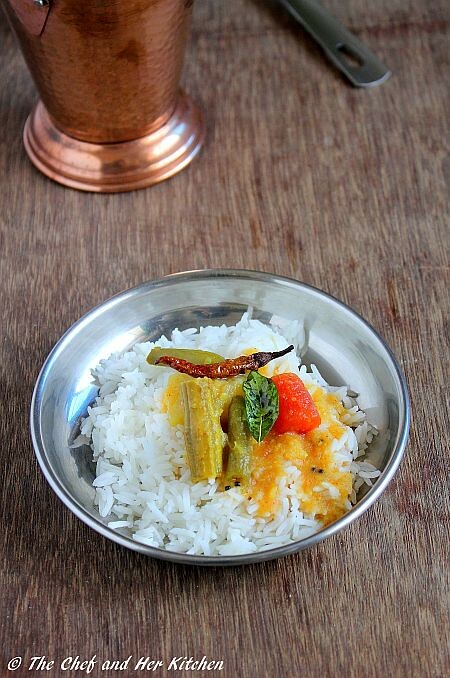 Usually Pulusu would be prepared with a combination of leftover vegetables but I usually buy various vegetables in small quantities to prepare this pulusu.I love this dish very much and hence I prepare it more often than I prepare sambar. 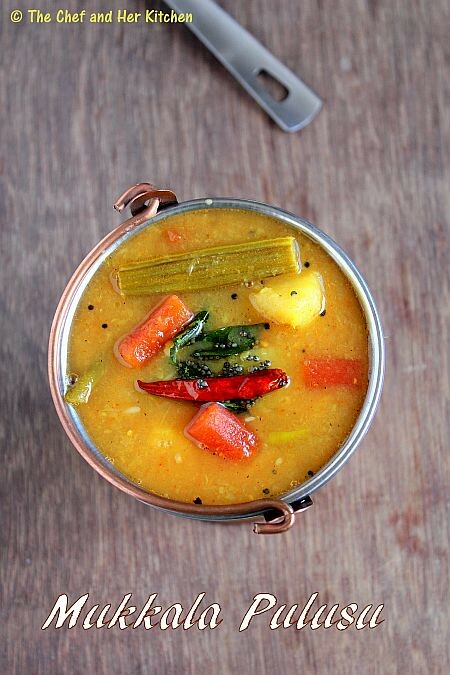 Though the ingredients that we add in Pulusu and sambar are similar,the taste of pulusu is totally different from Sambar.We add less quantity of toor dal and more vegetables in pulusu unlike Sambar where we add more quantity of toor dal and less vegetables. 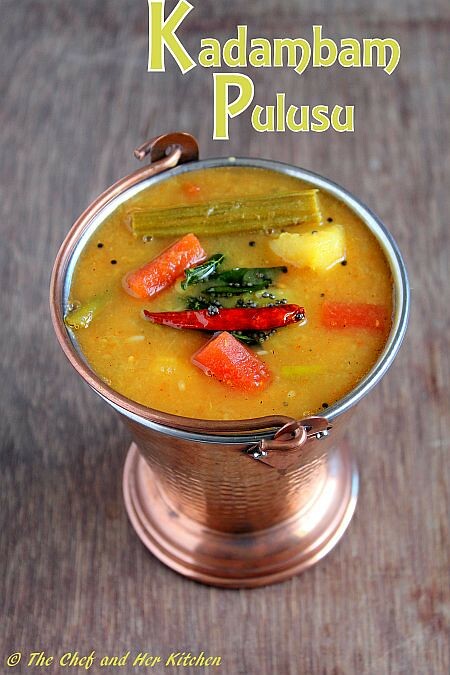 Pulusu is very tangy,spicy and slightly sweet compared to sambar. Pressure cook toor dal for 3 whistles until done.Mash the toor dal nicely and keep it aside. Soak tamarind in water for 10-15 mins and remove tamarind pulp and keep it aside.Add 1 cup of water to it. Add chopped vegetables(chop the vegetables in big chunks),slit green chillies,onions,tomatoes,few curry leaves to the tamarind pulp and add salt and turmeric powder and pressure cook for one whistle. After the pressure drops down add cooked dal to the boiled vegetables and add grated jaggery,salt and sambar powder(or red chili powder) and cook for few more minutes until you get the required consistency..The consistency should neither be very thick nor very thin. Meanwhile heat oil in a small tadka pan and crackle mustard seeds,red chillies,curry leaves and asafoetida and fry well and add this to the boiling Pulusu(stew). Serve it hot with rice and papad/Curd chili/fryums.You can serve it with cooked and mashed toor dal(mudda pappu). I usually add vegetables like drumsticks,pumpkin,bottlegourd,beans,carrot,sweet potato which I strongly recommend to use them as they impart a nice flavor to the stew.But you can add other vegetables like brinjal,ladies finger,winter melon,potatoes too in the recipe.If you are using ladies finger I would suggest to saute them in oil before you boil it with other vegetables. Few do not add toor dal in the recipe,in that case you can thicken then pulusu/stew with a tbsp of rice flour(which is mixed in water) and boil it along with pulusu until you get desired consistency.But I always prefer to add the dal to thicken instead of rice flour mixture.It is your wish,but do not add more amount of toor dal as it will change the taste of it. We use more amount of tamarind pulp in the recipe,so adjust the jaggery and salt according to your taste buds. 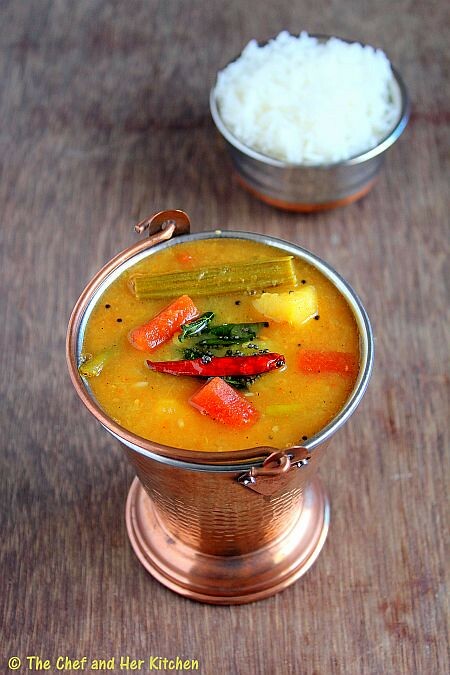 You can add red chili powder or sambar powder or a mix of both in the recipe. Always cut vegetables into big chunks for this pulusu.